Markus Eisele walks you through the creation of a complete reactive microservices-based system. This is the full ebook "Developing Reactive Microservices," by Markus Eisele. A downloadable edition of this ebook is also available. With microservices taking the software industry by storm, traditional enterprises are forced to rethink what they’ve been doing for almost two decades. It’s not the first time technology has shocked the well-oiled machine of software architecture to its core. We’ve seen design paradigms change over time and project management methodologies evolve. Old hands might see this as another wave that will gently find its way to the shore of daily business. But this time it looks like the influence is far bigger than anything we’ve seen before. And the interesting part is that microservices aren’t new. Talking about compartmentalization and introducing modules belongs to the core skills of architects. Our industry has learned how to couple services and build them around organizational capabilities. The really new part in microservices-based architectures is the way truly independent services are distributed and connected back together. Building an individual service is easy. Building a system out of many is the real challenge because it introduces us to the problem space of distributed systems. This is a major difference from classical, centralized infrastructures. As a result, there are very few concepts from the old world that still fit into a modern architecture. In the past, enterprise developers had to think in terms of specifications and build their implementations inside application server containers without caring too much about their individual life cycle. Creating standardized components for every application layer (e.g., UI, Business, Data, and Integration) while accessing components across them was mostly just an injected instance away. Connecting to other systems via messaging, connectors, or web services in a point-to-point fashion and exposing system logic to centralized infrastructures was considered best practice. It was just too easy to quickly build out a fully functional and transactional system without having to think about the hard parts like scaling and distributing those applications. Whatever we built with a classic Java EE or Spring platform was a "majestic monolith" at best. While there was nothing wrong with most of them technically, those applications can’t scale beyond the limits of what the base platform allows for in terms of clustering or even distributed caching. And this is no longer a reasonable choice for many of today’s business requirements. With the growing demand for real- and near-time data originating from mobile and other Internet-connected devices, the amount of requests hitting today’s middleware infrastructures goes beyond what’s manageable for operations and affordable for management. In short, digital business is disrupting traditional business models and driving application leaders to quickly modernize their application architecture and infrastructure strategies. The logical step now is to switch thinking from collaboration between objects in one system to a collaboration of individually scaling systems. There is no other way to scale with the growing demands of modern enterprise systems. Traditional application servers offer a lot of features, but they don’t provide what a distributed system needs. Using standard platform APIs and application servers can only be a viable approach if you scale both an application server and database for each deployed service and invest heavily to use asynchronous communication as much as possible. And this approach would still put you back into the 1990s with CORBA, J2EE, and distributed objects. What’s more, those runtimes are resource intensive and don’t start up or restart fast enough to compensate for failing instances. If that’s not enough, you’re still going to miss many parts of the so-called "outer architecture" like service discovery, orchestration, configuration, and monitoring. Many might think that service-oriented architecture (SOA) dressed up in new clothes is the perfect acronym for microservices. However, the answer to this question is twofold: yes, because the thoughts behind isolation, composition, integration, and discrete and autonomous services are the same; and no, because the fundamental ideas of SOA were often misunderstood and misused, resulting in complicated systems where an enterprise service bus (ESB) was used to hook up multiple monoliths communicating over complicated, inefficient, and inflexible protocols. This means the requirement for SOA is stronger than ever. And this might have been the biggest problem for SOA-based applications. They simply tried to apply a new technology stack without redesigning and re-architecturing the existing application portfolio. Model culture after open source organizations: meritocracy, shared consciousness, transparency, network, platforms. Let me issue a warning here: this book focuses on the implementation parts, rather than the organizational aspects, of reactive microservices. But you won’t succeed with a microservices architecture if you forget about them. While you can read a lot about how early adopters like Netflix structured their teams for speed instead of efficiency, the needs for enterprise-grade software are different. Teams are usually bigger and the software to be produced is more complex and involves a lot more legacy code. Nevertheless, there are good approaches to structuring enterprise-size development teams around business capabilities and in small units while retaining the relevant steering mechanisms. The many organizational aspects are summarized in a great presentation by Fred George. The most important individual principle from this presentation is: “When you build it, you own it.” From development to testing to production. There are other surrounding innovations that are creating new opportunities and platform approaches for traditional enterprises. Our industry is learning how everything fits into the bigger picture of distributed systems by embracing all the individual parts and architecting the modern enterprise. The pyramid in Figure 1-1 was introduced in my first book and breaking it down into individual parts and technologies from an implementation perspective is a natural next step. Virtualization and infrastructures have been major trends in software development, from specialized appliances and software as a service (SaaS) offerings to virtualized datacenters. In fact, most of the applications we use—and cloud computing as we know it today—would not have been possible without the server utilization and cost savings that resulted from virtualization. But now new cloud architectures are reimagining the entire data center. Virtualization as we know it is reaching the limits of what is possible for scaling and orchestration of individual applications. With today’s applications looking to exploit smaller runtimes and individual services, the need for a complete virtualized operating system (OS) is decreasing. What originated with the Internet giants like Google and Facebook quickly caught the attention of major enterprise customers who are now looking to adopt containers and orchestration. And the trust put forward into cloud-based solutions using those technologies is only increasing. Both virtual machines and containers are means of isolating applications from hardware. However, unlike virtual machines—which virtualize the underlying hardware and contain an OS along with the application stack—containers virtualize only the OS and contain only the application. As a result, containers have a very small footprint and can be launched in mere seconds. A physical machine can accommodate four to eight times more containers than VMs. With the transformation of data centers, and the switch over to more lightweight container operation systems, our industry is fully adopting public, private, and hybrid cloud infrastructures. The traditional method of data access in monoliths (e.g., Java database access—JDBC) doesn’t scale well enough in highly distributed applications because JDBC operations block the socket input/output (IO) and, further on, blocks the thread they run on. The key concept of immutability plays a very important role in microservices. They are thread-safe and you don’t run into synchronization issues. And while they can’t be changed, there is no problem parallelizing work without conflicting access. This is extremely helpful in representing commands, messages, and states. It also encourages developers to implement distributed systems with an event-sourced architecture. There is no need for O/R mapping. Events are logged and part of the domain model. With every change being captured as an event, the current state can easily be replayed and audited because both operate on the same data. Persistence works without updates or deletes, the most expensive data manipulation operations. With these approaches in mind, there is no longer a need for traditional relational database management systems (RDBMS). The persistence of modern applications allows for the embrace of NoSQL-based data stores. A NoSQL (originally referring to "non-SQL" or "nonrelational") database provides a mechanism for storage and retrieval of data that is modeled differently than the tabular relations used in relational databases. Combining these technologies with the JVM allows developers to build a "fast data" architecture. The emphasis on immutability improves robustness, and data pipelines are naturally modeled and implemented using collections (like lists and maps) with composable operations. The phrase "fast data" captures the range of new systems and approaches, which balance various tradeoffs to deliver timely, cost-efficient data processing, as well as higher developer productivity. Handling streams of data, especially “live” data whose volume is not predetermined, requires special care in an asynchronous system. The most prominent issue is that resource consumption needs to be controlled so that a fast data source does not overwhelm the stream destination. Asynchronicity is the better way to enable the parallel use of computing resources on collaborating network hosts or multiple CPU cores within a single machine. This report walks you through the creation of a sample reactive microservices-based system. The example is based on Lagom, a new framework that helps Java developers to easily follow the described requirements for building distributed, reactive systems. As an Apache-licensed, open source project, it is freely available for download, and you can try out the example yourself or play with others provided in the project’s GitHub repository. Going forward, Reactive Microservices and Basic Principles provides an overview of the reactive programming model and basic requirements for developing reactive microservices. Implementing Reactive Microservices in Java looks at creating base services, exposing endpoints, and then connecting them with a simple, Web-based user interface. Dealing with Persistence, State, and Clients deals with the application’s persistence, while Migration and Integration focuses on first pointers for using integration technologies to start a successful migration away from legacy systems. Traditional application architectures and platforms are obsolete. With classical application platforms no longer an option for today’s business requirements, Java developers have little to no choice but to switch to new technologies and paradigms. However, very few of these technologies are built to make an easy transition from traditional Java and Java EE development paradigms. The need to write applications that must be uncompromisingly robust, reliable, available, scalable, secure, and self-healing resulted in the creation of techniques and tools to address these new requirements, such as Akka, Vert.x, and Netty. The key to implementing reactive microservices in Java-based systems is to find a very opinionated way to build, run, and scale applications on the JVM. Microservices need to be asynchronous by default. Relying on synchronous REST creates coupling that affects productivity, scalability, and availability. These are requirements only a new microservices framework can solve based on the principles of asynchronous message passing, event-based persistence through event sourcing, and CQRS out-of-the-box. All of these requirements are hard to compare with classic middleware platforms as they embrace a new way of programming based on the Reactive Manifesto. Reactive principles are not new. They have been proven and hardened for more than 40 years, going back to the seminal work by Carl Hewitt and his invention of the Actor Model, Jim Gray and Pat Helland at Tandem Systems, and Joe Armstrong and Robert Virding and their work on Erlang. These people were ahead of their time, but now the world has caught up with their innovative thinking and we depend on their discoveries and work more than ever. Up until now, the usual way to describe reactive applications has been to use a mix of technical and industry buzzwords, such as asynchronous, nonblocking, real-time, highly available, loosely coupled, scalable, fault-tolerant, concurrent, reactive, message-driven, push instead of pull, distributed, low latency, and high throughput. 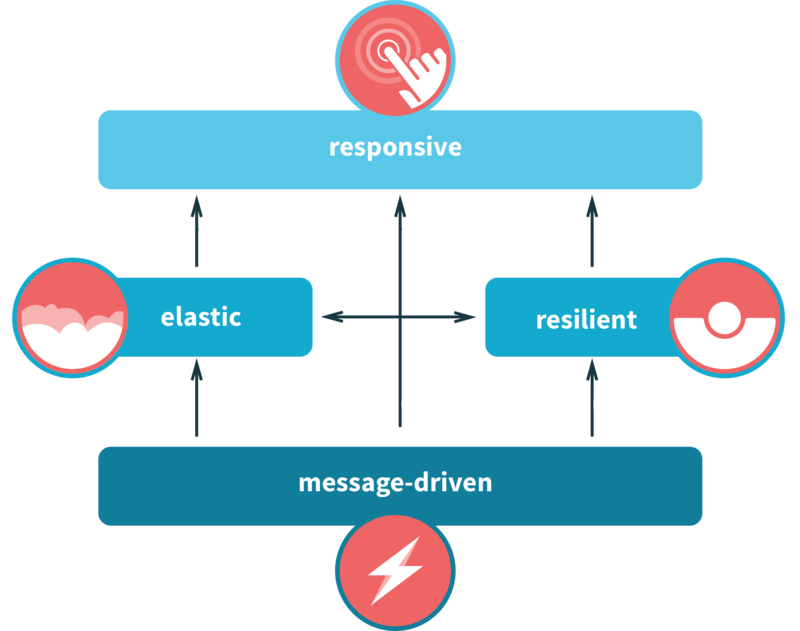 The Reactive Manifesto brings all of these characteristics together and defines them through four high-level traits: responsive, resilient, elastic, and message-driven (Figure 2-1). Even if it looks like this describes an entirely new architectural pattern, the core principles have long been known in industries that require real-time IT systems, such as financial trading. If you think about systems composed out of individual services, you will realize how closely the reactive world is related to microservices. Let’s explore the four main characteristics of a reactive microservices system closer. The first and foremost quality of a service is that it must respond to requests it receives. The same holds true in those cases where services consume other services. They also expect responses in order to be able to continue to perform their work. A responsive application satisfies consumers’ expectations in terms of availability and real-time responses. Responsiveness is measured in latency, which is the time between request and response. A very high-quality service performs its function without any downtime at all. But failures do happen and handling failure of an individual service in a gentle way without affecting the complete system is what the term resiliency describes. As a matter of fact, there is only one generic way to protect your system from failing as a whole when a part fails: distribute and compartmentalize. A successful service will need to be scalable both up and down in response to changes in the rate at which the service is used. With sudden traffic bursts hitting an application, it must be able to make use of increased hardware capacity when needed. This includes not only working on one machine but also how to facilitate the power of several physical nodes in a network spanning various locations transparently. The only way to fulfill all of the above requirements is to have loosely coupled services with explicit protocols communicating over messages. Also known as “share nothing” architecture, this removes scalability limits imposed by Amdahl’s law. Components can remain inactive until a message arrives, freeing up resources while doing nothing. In order to realize this, nonblocking and asynchronous APIs must be provided that explicitly expose the system’s underlying message structure. But how do developers implement all of the above requirements and not use blocking and synchronous APIs? Reactive programming is the answer. At the very core this is a programming paradigm based on asynchronous message passing. This is used to establish a boundary between components that ensures loose coupling, isolation, and location transparency, and provides the means to delegate errors as messages. You can create data streams of anything. Streams are cheap in terms of memory consumption and quite ubiquitous. You can use anything as a stream: variables, user inputs, properties, caches, and data structures. And if you’re thinking about StAX (streaming API for XML) right about now, I don’t blame you. Working on a stream of data and generating output while the final element hasn’t been received is exactly that kind of thinking—reacting to messages immediately when they arrive. But reactive programming is closer to functional programming in general. A stream can be an input to another one. Even multiple streams can be used as inputs to another stream. You can merge two streams. You can filter a stream to get another one that has only those messages you are interested in. You can map data values from one stream to a new one. Java 8 introduced the Streams API, but this is a functional view over collections. Java 9 is slated to include the Reactive Streams specification. Reactive programming raises the level of abstraction in your code so you can focus on the interdependence of messages that define the business logic, rather than having to handle a large amount of implementation details. And working with streams is only one part of it. In order to be fast and lightweight, the number of updates to existing data structures should be limited or eliminated. This is where immutable (or unmodifiable) data structures come in. Microservices are collaborative in nature and only make sense as systems. A complete explanation of all of these traits can be found in the Reactive Microservices Architecture report. Getting just what you need is more valuable than getting lots of something. When people talk about microservices, they focus on the "micro" part, saying that a service should be small. I want to emphasize that the important thing to consider when splitting a system into services is to find the right boundaries between services, aligning them with bounded contexts, business capabilities, and isolation requirements. As a result, a microservices-based system can achieve its scalability and resilience requirements, making it easy to deploy and manage. A Service API that provides a way to declare and implement service interfaces, to be consumed by clients. For location transparency, clients use stable addresses and discover services through a service locator. The Service API supports synchronous request-response calls as well as asynchronous messaging and streaming between services. The Persistence API provides event-sourced persistent entities for services that store data, with CQRS read-side support for queries. It manages the distribution of persisted entities across a cluster of nodes, enabling sharding and horizontal scaling, with Cassandra as the default database backend. The Development Environment allows you to run all your services, and the supporting Lagom infrastructure, with one command. It hot-reloads your services when code changes. Lagom Services can be deployed as they are directly to production using ConductR, a platform for monitoring—and scaling—of Lagom services in a container environment—no additional infrastructure needed. Lagom also relies on a couple of well-known technologies that are wired together to raise productivity during the development of a distributed microservices system. The first version of Lagom provides a Java API for writing microservices. Before long, a subsequent version will add a Scala API. Lagom’s Java APIs target Java 8. They assume familiarity with Java 8 features such as lambdas, default methods, and optional. One place where some light Scala coding is required, even for Java users, is in Lagom build definitions, which must be written using sbt’s Scala DSL. Lagom’s sbt-based development console allows you to run any number of services together with a single command. Lagom has support for Cassandra as a data store, both for the write-side and read-side. Cassandra is a very scalable distributed database, and it is also flexible enough to support typical use cases of reactive services. By default, Lagom services needing to persist data use Cassandra as a database. For convenience, the development environment embeds a Cassandra server. Lagom is implemented on top of the Play Framework. This is an implementation detail that will not directly concern simple microservices. More advanced users may wish to use some Play APIs directly. Play is built on the popular standard Netty network transport library. If you have an existing Play Framework application that you want to add microservices to there is an sbt plugin (PlayLagom) to help you. Lagom Persistence, Publish-Subscribe, and Cluster are implemented on top of Akka, a toolkit for building concurrent, distributed, and resilient message-driven applications. This is an implementation detail that will not directly concern simple microservices. More advanced users may wish to use some Akka APIs directly. A Lagom service may be “simple” or “streamed”; this is described further later in this report in the section Service Implementation. Streaming asynchronous Lagom services are built on top of Akka Streams. Lagom and many of its component technologies are configured using the Lightbend Config library. The configuration file format is HOCON, a powerful and expressive superset of JSON. The core concepts of reactive microservices have been introduced by Jonas Bonér in his report, Reactive Microservices Architecture. He clearly explains the main characteristics of microservices as a set of isolated services, each with a single area of responsibility. This forms the basis for being able to treat each service as a single unit that lives and dies in isolation—a prerequisite for resilience—and can be moved around in isolation—a prerequisite for elasticity. But they also own their state. Each microservice has to take sole responsibility for its own state and persistence. Modeling each service as a bounded context can be helpful since each service usually defines its own domain, each with its own ubiquitous language. Both of these techniques are taken from domain-driven design (DDD). Of all the new concepts introduced in reactive microservices applications, consider DDD a good place to start learning. Microservices and the terms you hear in context are heavily influenced by DDD. The philosophy of DDD is about placing the attention at the heart of the application, focusing on the complexity of the core business domain. Alongside the core business features, you’ll also find supporting subdomains that are often generic in nature, such as money or time. DDD aims to create models of a problem domain. All the implementation details—like persistence, user interfaces, and messaging—come later. DDD was first introduced by Eric Evans in his book Domain-Driven Design: Tackling Complexity in the Heart of Software. In this book he also discusses an example application, the Cargo tracker. The example in this report follows the main business ideas showcased there and implements a first set of features. The source code for the example application is available on GitHub. Please keep in mind that it is not a complete implementation of the well-known DDD example but merely a starting point. It will help you understand how to develop a reactive microservices system and is meant to be a playground for getting started. The following examples assume you are using Mac OS. Find more information on how to install sbt and Java 8 in the Lagom documentation. The project folder with sbt-specific files. When inspecting the list of running services, you may wonder how ports are being assigned. Ports are assigned consistently, meaning that once a port is assigned to a service it will never change again. The port is deterministic even for different machines. An algorithm creates it out of the service and project name and maps it onto the default port range. With that said, you can change the settings easily. Pointing your browser to the service gateway address will bring up the screen shown in Figure 3-1. [info] s.c.r.i.RegistrationServiceImpl - Cargo ID: 154038. Now it’s time to look at what happened under the hood. Open the project in IntelliJ and review the registration service. You can also refer to the Lagom documentation for importing your project into your IDE of choice. This example makes use of Immutables, which is the recommended way for Lagom applications to handle commands, events, and states. Immutables is a library that creates immutable objects and reduces boilerplate code to a minimum. Make sure to set up the code generation in your IDE for the project correctly. There are two projects with the prefix registration. One is the API project and the other the implementation project. The API project contains a service interface through which consumers may interact with the service, while the implementation project contains the actual service implementation. The registration-api project contains two classes. The RegistrationService contains the service description that is defined by an interface. This interface not only defines how the service is invoked and implemented, it also defines the metadata that describes how the interface is mapped down onto an underlying transport protocol. Generally, the service descriptor, and its implementation and consumption, should remain agnostic to what transport is being used, regardless of whether that’s REST, Websocket, or other transports. The descriptor defines a service with two calls: register() and getLiveRegistrations(). Both return a ServiceCall, which is a representation of the call that can be invoked when consuming the service. Unlike what most Java developers are used to, an invocation of both methods does not actually invoke the call but gives you a handle to it, which has to be invoked with the ServiceCall.invoke() method. A ServiceCall takes three type parameters and id, which is extracted from the incoming identifier, e.g., the path in the case of a REST request. As the akka.NotUsed indicates, this example doesn’t have an ID and its REST transport implementation is going to use a static path. Request and Response reflect incoming and outgoing messages. Cargo is the request and akka.Done the response. After implementing and invoking the register() call, the mapping to the actual transport is still missing. This is done by providing a default implementation of the Service.descriptor() method. The implementation is pretty self-explanatory. A service named registrationService is returned that contains two REST calls. The call mapping to the register() service call is a POST request to /api/registration and the getLiveRegistrations() call is a GET request mapped to /api/registration/live. We have to look back to the identifiers a bit. In fact, the mapping to the transport is only one aspect. Even more important is that each service call needs to have an identifier to provide routing information to the client and the service to make sure the calls are mapped appropriately. As explained before, our example doesn’t use a dynamic part and thus returns akka.NotUsed. But we still need one and this example uses both, a path-based identifier that uses a URI path and query string (pathCall()) to route calls and a REST identifier (restCall()). REST identifiers should be used when you’re creating a semantic REST API. They use both a path, as with the path-based identifier, and a request method to identify them. To learn more about configuration and usage of identifiers in general, refer to the path-based identifier section in the Lagom documentation. A strict message is a single message that can be represented by a simple Java object. The message will be buffered into memory, and then parsed, for example, as JSON. When both message types are strict, the call is said to be a synchronous call, i.e., a request is sent and received, then a response is sent and received. The caller and callee have synchronized their communication. A streamed message is a message of type Source, which is an Akka Streams API that allows asynchronous streaming and handling of messages. This is what the getLiveRegistrations() call returns. A stream of Source<Cargo> is returned as the response message. Instead of using synchronous REST calls, Lagom chooses an appropriate transport for the stream, which will typically be WebSockets. WebSockets support bidirectional streaming, and is a good general-purpose option for streaming. By default all messages are serialized and deserialized to JSON by using Jackson. To change this behavior or to write and configure custom message serializers, see Message Serializers in the Lagom documentation. The message passed around in this example is a Cargo object. And it is also part of the registration-api project because it is part of the external API. This is a simple value object on first sight. But looking closer, we can see that it is an immutable object, which means it cannot be modified after it is created. All fields are final and are assigned at construction time. There are no setter methods. Lagom doesn’t care which library you use to create your immutable objects. You can also write your immutable objects yourself or use another library. If you are going to use the Immutables library, make sure to also add the lagomJavadslImmutables dependency in your project/plugins.sbt file. The generated Cargo.java class can be found in the target/scala-2.11/src_managed folder of the registration-api project. Deeper coverage about immutables and how to use them is part of the Lagom documentation. We have now explored the complete registration-api project and it is time to move on to the service implementation. // Publish received entity into topic named "Topic"
The service call just returns akka.Done. Let’s try to find out what actually happens here. The first two lines represent a publish/subscribe topic. The line starting with PubSubRef<Cargo> topic = ... creates a topic with the name "topic" and registers it with the PubSubRegistry. The next line publishes a single object into the topic. You can find the consuming side of the topic in the second service call, getLiveRegistrations(). A simple log entry via Log4J was the initial smoke test. And now it is time to learn about how to persist data. There is no serious enterprise-grade application without persistent data. And the same is true for microservices-based applications. Event sourcing and CQRS are fundamental concepts behind Lagom’s support for services that store information. To understand these concepts, it is recommended that you read Lagom’s CQRS and Event Sourcing documentation. When using event sourcing, all changes are captured as domain events, which are immutable facts of things that have happened. The persistent equivalent is called an AggregateRoot (PersistentEntity). This is a cluster of domain objects that can be treated as a single unit. An example may be a piece of cargo and its transport legs, which will be separate objects, but it’s useful to treat the cargo (together with its transport legs) as a single aggregate. The aggregate can reply to queries for a specific identifier but it cannot be used for serving queries that span more than one aggregate. Therefore, you need to create another view of the data that is tailored to the queries that the service provides (see Figure 4-1). 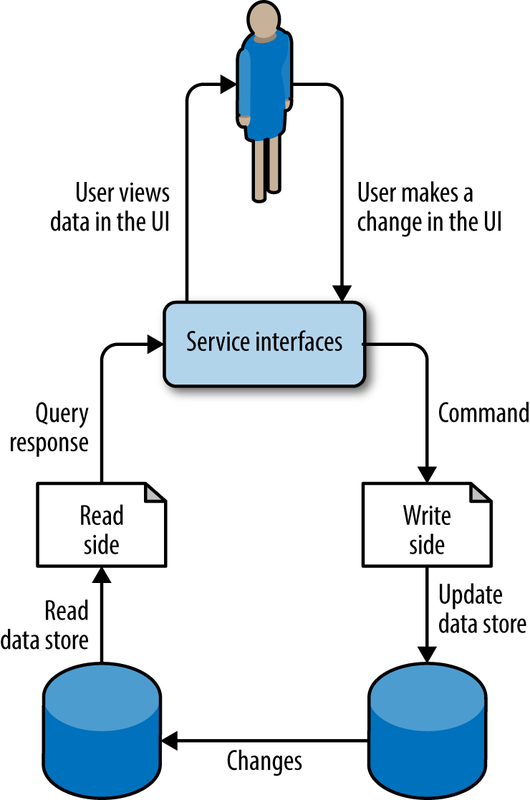 This separation of the write-side and the read-side of the persistent data is often referred to as the CQRS pattern. To implement persistence in Lagom you have to implement a class that extends PersistentEntity<Command, Event, State>. If you are familiar with JPA, you might want to consider a PersistentEntity as a mixture between data access objects (DTOs) and a JPA @Entity. But the differences are obvious. While a JPA entity is loaded from the database wherever it is needed, there may be many Java object instances with the same entity identifier. In contrast, there is only one instance of PersistentEntity with a given identifier. With JPA you typically only store the current state and the history of how the state was reached is not captured. You interact with a PersistentEntity by sending command messages to it. Commands are processed sequentially, one at a time, for a specific entity instance. A command may result in state changes that are persisted as events, representing the effect of the command. The current state is not stored for every change, since it can be derived from the events. These events are only ever appended to storage; nothing is ever mutated, which allows for very high transaction rates and efficient replication. // Look up the CargoEntity for the given ID. // Tell the entity to use the Cargo information in the request. We made it all the way through the service implementation down to the CargoEntity. This is an event-sourced entity. It has a state CargoState, which stores information about the registered cargo. It can also receive commands that are defined in the RegistrationCommand and translate them into events that are defined in the RegistrationEvent class. This event is emitted when a RegisterCargo command is received. Events and commands are nothing more than immutable objects. Let’s add the different behaviors to handle the command and trigger events. The event handlers are typically only updating the state, but they may also change the behavior of the entity in the sense that new functions for processing commands and events may be defined. Learn more about this in the PersistentEntity documentation. To see the consumer side, you have to look into the front-end project and open the ReactJS application in main.jsx. The createCargoStream() function points to the API endpoint and the live cargo events are published to the cargoNodes function and rendered accordingly (see Figure 4-2). 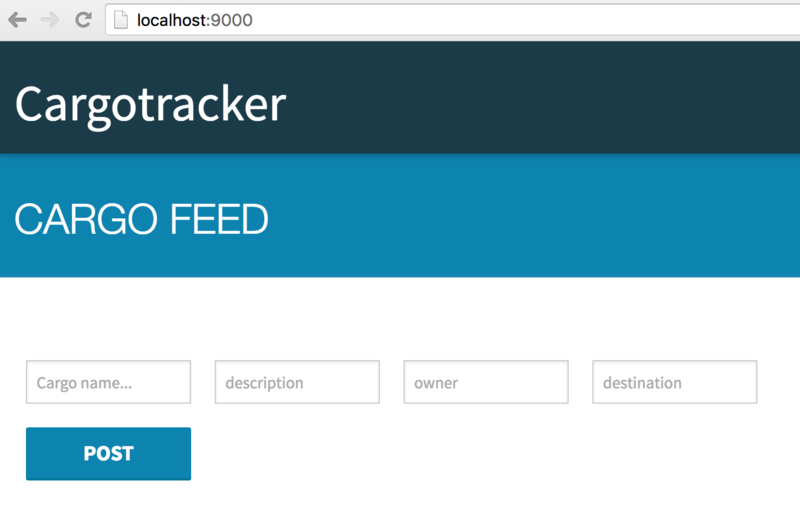 One last step in this example is to add a REST-based API to expose all the persisted cargo to an external system. While persistent entities are used for holding the state of individual entities—and to work with them you need to know the identifier of an entity—the readAll (select *) is a different use case. Another view on the persisted data is tailored to the queries the service provides. Lagom has support for populating this read-side view of the data and also for building queries on the read-side. Finally, the RegistrationEvent also needs to extend the AggregateEvent<E> interface. Now, we’re ready to implement the remaining methods of the CargoEventProcessor. Tables and prepared statements need to be created first. Further on, it has to be decided how to process existing entity events, which is the primary purpose of the prepare method. Each event is associated with a unique offset, a time-based UUID. The offset is a parameter to the event handler for each event and should typically be stored so that it can be retrieved with a select statement in the prepare method. You can use the CassandraSession to get the stored offset. "CREATE TABLE IF NOT EXISTS cargo ("
+ "cargoId text, name text, description text,"
+ "owner text, destination text,"
"CREATE TABLE IF NOT EXISTS cargo_offset ("
+ "partition int, offset timeuuid, "
+ "(cargoId, name, description, "
The last missing piece is the event handler. Whenever a CargoRegistered event is received, it should be persisted into the table. The events are processed by event handlers that are defined in the method defineEventHandlers, one handler for each event class. A handler is a BiFunction that takes the event and the offset as parameters and returns zero or more bound statements that will be executed before processing the next event. In this example we add one row to the cargo table and update the current offset for each RegistrationEvent. It is safe to keep state in variables of the enclosing class and update it from the event handlers. The events are processed sequentially, one at a time. An example of such state could be values for calculating a moving average. If there is a failure when executing the statements the processor will be restarted after a backoff delay. This delay is increased exponentially in the case of repeated failures. There is another tool that can be used if you want to do something else with the events other than updating tables in a database. You can get a stream of the persistent events with the eventStream method of the PersistentEntityRegistry. We’ve seen how to define service descriptors and implement them, but now we need to consume services. The service descriptor contains everything Lagom needs to know to invoke a service. Consequently, Lagom is able to implement service descriptor interfaces for you. Make sure to also add the dependency between both projects in the build.sbt file by adding .dependsOn(registrationApi) to the shipping-impl project. All service calls with Lagom service clients are by default using circuit breakers. Circuit breakers are used and configured on the client side, but the granularity and configuration identifiers are defined by the service provider. By default, one circuit breaker instance is used for all calls (methods) to another service. It is possible to set a unique circuit breaker identifier for each method to use a separate circuit breaker instance for each method. It is also possible to group related methods by using the same identifier on several methods. You can find more information about how to configure the circuit breaker in the Lagom documentation. One of the most pressing concerns that come bundled with every new technology stack is how to best integrate with existing systems. With the fundamental switch from monolithic to distributed applications, the integrity of a migration of existing code or functionality will have to be considered. The need to rearchitect and redesign existing systems to adopt the principles of the new world is undoubtedly the biggest challenge. While Lagom and the reactive programing model is clearly favoring the greenfield approach, nothing is stopping you from striving for a brownfield migration. You have three different ways to get started with this. The most risk-free approach is using selective improvements. After the initial assessment, you know exactly which parts of the existing application can take advantage of a microservices architecture. By scraping out those parts into one or more services and adding the necessary glue to the original application, you’re able to scale out the microservices. There are many advantages to this approach. While doing archaeology on the existing system, you’ll receive a very good overview of the parts that would make for ideal candidates. And while moving out individual services one at a time, the team has a fair chance to adapt to the new development methodology and make its first experience with the technology stack a positive one. Comparable but not equal is the second approach where you run two different systems in parallel. First coined by Martin Fowler as the StranglerApplication, the refactor/extraction candidates move into a completely new technology stack, and the existing parts of the applications remain untouched. A load balancer or proxy decides which requests need to reach the original application and which go to the new parts. There are some synchronization issues between the two stacks. Most importantly, the existing application can’t be allowed to change the microservices’ databases. In very rare cases, complete refactoring of the original application might be the right way to go. It’s rare because enterprise applications will need ongoing maintenance during the complete refactoring. What’s more, there won’t be enough time to make a complete stop for a couple of weeks—or even months, depending on the size of the application—to rebuild it on a new stack. This is the least recommended approach because it carries comparably high business risks. This ultimately leads to the question of how to integrate the old world into the new. Even if the term "legacy" has an old and outdated touch to it, I use it to describe everything that is not already in a microservices-based architecture. You have existing business logic in your own applications. There are libraries and frameworks that provide access to some proprietary system and there may be host systems that need to be integrated. More specifically, this is everything that exists and still needs to function while you’re starting to modernize your applications. There are many ways to successfully do this. Please keep in mind, though, that this isn’t an architectural discussion of enterprise integration but a technical assessment of the interface technologies and how you can use them. 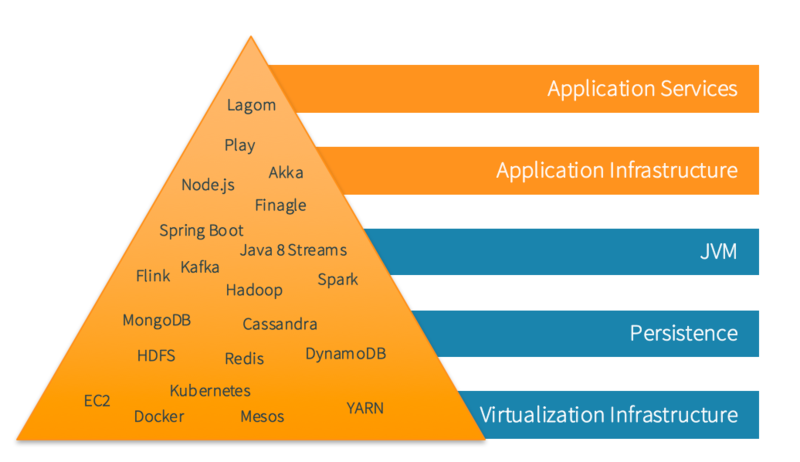 Figure 5-1 gives a high-level overview about integration technologies and how to use them with Lagom. Lagom builds upon and integrates very tightly with both Akka and Play. You can use Akka from your Lagom service implementations by injecting the current ActorSystem into it or directly into persistent entities with ordinary dependency injection. Details about the integration can be found in the Lagom documentation. Simple Object Access Protocol (SOAP) is heavily used in enterprise environments that already use an enterprise service bus (ESB). Play SOAP allows a Play application to make calls on a remote web service using SOAP. It provides a reactive interface for doing so, making HTTP requests asynchronously and returning promises/futures of the result. Keep in mind that Play SOAP builds on the JAX-WS spec, but implements the asynchronous method handling differently. Play supports HTTP requests and responses with a content type of JSON by using the HTTP API in combination with the JSON library. JSON is mapped via the Jackson library. Because Lagom applications can be written in Java, you are free to bundle every JDBC driver you feel is necessary to access existing database systems. You could also use libraries that implement existing specifications like JPA. But it is not a good fit in general. Another option would be to use the Play JPA integration. As soon as the Scala API for Lagom is available, Slick is the best option to choose. Slick is a modern database query and access library for Scala. It allows you to work with stored data almost as if you were using Scala collections while at the same time giving you full control over when a database access happens and which data is transferred. You can write your database queries in Scala instead of SQL, thus profiting from the static checking, compile-time safety, and compositionality of Scala. Slick features an extensible query compiler that can generate code for different backends. 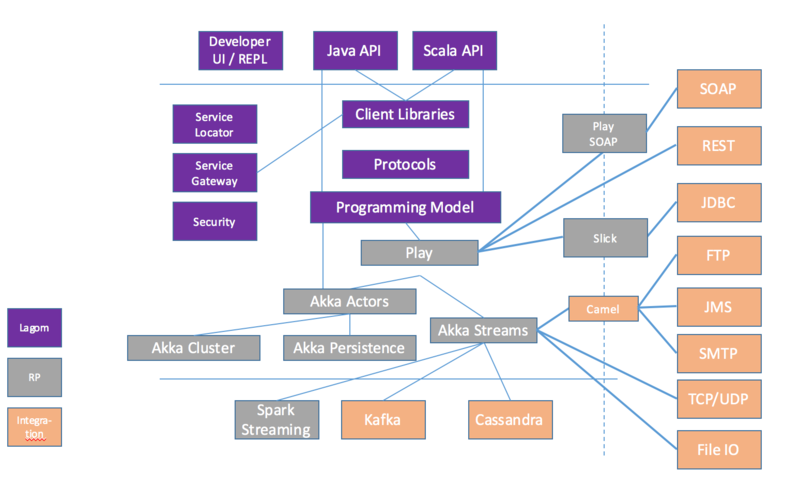 Akka Streams is an implementation of the Reactive Streams specification on top of the Akka toolkit that uses an actor-based concurrency model. Using it this way, you can connect to almost all stream-based sources. A detailed explanation can be found in the Akka Streams Cookbook. This is a collection of patterns to demonstrate various usage of the Akka Streams API by solving small targeted problems in the format of "recipes." The akka-camel module allows untyped actors to receive and send messages over a great variety of protocols and APIs. In addition to the native Scala and Java actor API, actors can now exchange messages with other systems over a large number of protocols and APIs, such as HTTP, SOAP, TCP, FTP, SMTP, or JMS, to mention a few. At the moment, approximately 80 protocols and APIs are supported. Technically, there are more ways to integrate and talk to the legacy world. This chapter was written to give you a solid first overview of the most important protocols and technologies.